Atlas Dewatering is your sewer bypass provider of choice. From large jobs to small jobs, we have the experience you need to get the job done efficiently and effectively, the availability of products and service to cover your needs whenever and wherever they occur. Atlas Dewatering’s emergency response culture understands the urgency of your projects. Count on Atlas Dewatering for all of your sewer bypass requirements. 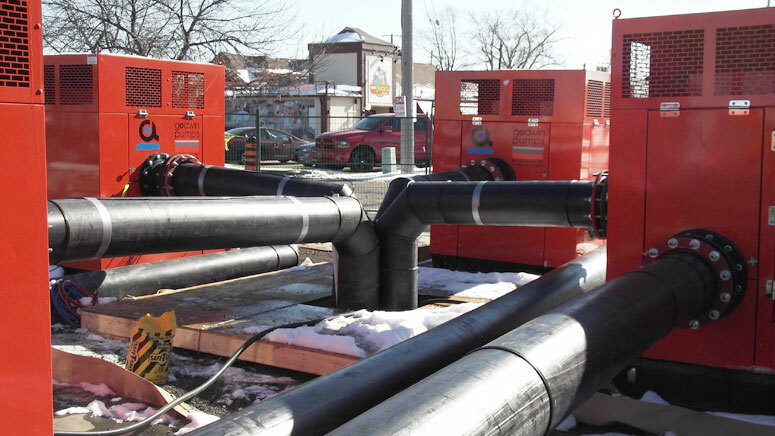 With the Godwin Dri-Prime Backup System, you’ll get independently-powered pumping in one dependable package for emergencies including primary power, switch gear, and sewage pump failures or repairs; and for primary pumping during routine maintenance. Plus, the Dri-Prime Backup System seamlessly interfaces with your existing control systems, allowing you to maintain electronic remote monitoring. Maintaining system integrity is vital, and there’s no better way to ensure it than with the Dri-Prime backup System. Atlas Dewatering pumps are used for boosting water main pressure, emergency over pumping in the event of pump station breakdown, and water main repair and maintenance. Also in dry/drought conditions, the units are used for pumping from wells to holding reservoirs.